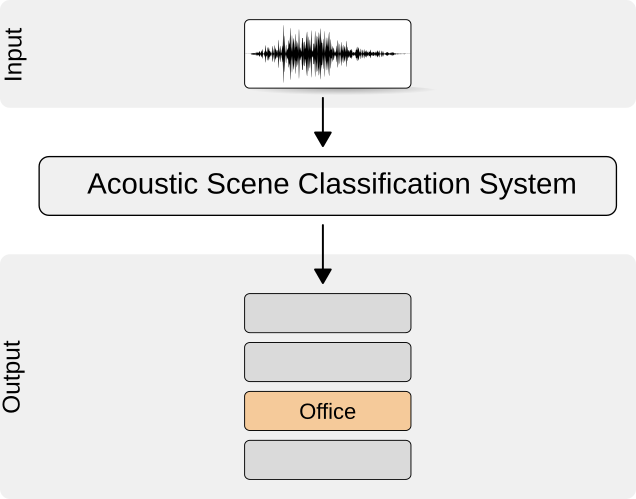 The goal of acoustic scene classification is to classify a test recording into one of the provided predefined classes that characterizes the environment in which it was recorded — for example "park", "home", "office". Figure 1: Overview of acoustic scene classification system. TUT Acoustic Scenes 2017 dataset will be used as development data for the task. The dataset consists of recordings from various acoustic scenes, all having distinct recording locations. For each recording location, 3-5 minute long audio recording was captured. The original recordings were then split into segments with a length of 10 seconds. These audio segments are provided in individual files. Detailed description of acoustic scenes included in the dataset can be found DCASE2016 Task1 page. 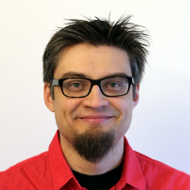 The dataset was collected in Finland by Tampere University of Technology between 06/2015 - 01/2017. 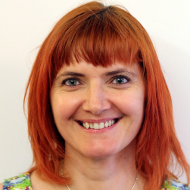 The data collection has received funding from the European Research Council. For all acoustic scenes, the recordings were captured each in a different location: different streets, different parks, different homes. Recordings were made using a Soundman OKM II Klassik/studio A3, electret binaural microphone and a Roland Edirol R-09 wave recorder using 44.1 kHz sampling rate and 24 bit resolution. The microphones are specifically made to look like headphones, being worn in the ears. As an effect of this, the recorded audio is very similar to the sound that reaches the human auditory system of the person wearing the equipment. Postprocessing of the recorded data involves aspects related to privacy of recorded individuals. For audio material recorded in private places, written consent was obtained from all people involved. Material recorded in public places does not require such consent, but was screened for content, and privacy infringing segments were eliminated. Microphone failure and audio distortions were annotated, and the annotations are provided with the data. Based on experiments in DCASE 2016, eliminating the error regions in training does not influence the final classification accuracy. The evaluation set does not contain any such audio errors. TUT Acoustic Scenes 2017 dataset consist of two subsets: development dataset and evaluation dataset. The development dataset consists of the complete TUT Acoustic Scenes 2016 dataset (both development and evaluation data of the 2016 challenge). The partitioning of the data into subsets was done based on the location of the original recordings, so the evaluation dataset contains recordings of similar audio scenes but from different geographical locations. All segments obtained from the same original recording were included into a single subset - either development dataset or evaluation dataset. For each acoustic scene, there are 312 segments (52 minutes of audio) in the development dataset. A cross-validation setup is provided for the development dataset in order to make results reported with this dataset uniform. The setup consists of four folds distributing the available segments based on location. The folds are provided with the dataset in the directory evaluation setup. Fold 1 of the provided setup reproduces the DCASE 2016 challenge setup, by using the 2016 development set as training subset and the 2016 evaluation set as test subset. Important: If you are not using the provided cross-validation setup, pay attention to the segments extracted from same original recordings. Make sure that for each given fold, ALL segments from same location must be either in the training subset OR in the test subset. The scoring of acoustic scene classification will be based on classification accuracy: the number of correctly classified segments among the total number of segments. Each segment is considered an independent test sample. The baseline system is based on a multilayer perceptron architecture using log mel-band energies as features. A 5-frame context is used, resulting in a feature vector length of 200. Using these features, a neural network containing two dense layers of 50 hidden units per layer and 20% dropout is trained for 200 epochs. Classification decision is based on the network output layer which is of softmax type. A detailed description is available in the baseline system documentation. The baseline system includes evaluation of results using accuracy as metric. Classification unit: one file (10 seconds of audio). Acoustic scene classification results, averaged over evaluation folds. Annamaria Mesaros, Toni Heittola, and Tuomas Virtanen. Acoustic scene classification: an overview of DCASE 2017 challenge entries. In 2018 16th International Workshop on Acoustic Signal Enhancement (IWAENC), 411–415. September 2018. doi:10.1109/IWAENC.2018.8521242.